We had been looking at Fall because of the weather, I can't do cold. Would need to look closely at trains, here in the UK it is not always easy, you usually need to book so that they can have helpers at both stations on the journey. I did have another option of taking her to Reno, NV a trade show I used to attend has moved there from Vegas and I could combine work with a vacation, we used to do this when the trade show was in Vegas but it ain't NYC. Buses, subways, trains and cabs are available now and be used by our community fine. That view is backed up by a lot of comments I've read on line. It seems that a small % of subway stations are fully accessible and cabs not big enough for a power chair. It is really confusing for a non city dweller like me when I never use public transport. We were in NYC in October. We used the Curb app. I was able to use the wheelchair accessible vans with no problems with my Quickie 646SE. I know roll positive has obviously had a different experience, but this wikipedia page suggests 25% of the stations are accessible in the NYC subway system. Those that are inaccessible almost certainly have stairs and in my experience (15 years out of date) often have cages for people to walk through one at a time to avoid people hopping the turnstile and thus even if you negotiate the stairs with some help your wheelchair is not going to physically get through the gate. Also in the sections of older construction there are going to be a lot of businesses with a big step or two up to the retail entrance for shopping/restaurants/etc. I don't know how much traveling you've done in the US in the past, but in my experience I'd say NYC is the most inaccessible city in the country, perhaps rivaled by some of the older towns in the Northeast like philadelphia and boston when it comes to transportation and buildings. If you don't mind taking a taxi everywhere or rolling in the wheelchair it shouldn't be a problem, there are plenty enough activities, shops and restaurants that you can get to. Hope you have fun on your trip. What information are you using that is saying not to use the subway? Also remember New York has a great bus system and Wow which is for wheelchair cabs only. You cant rent lifts from local DMEs in town vs bringing yours. Last if your not a cold weather person I would come out in end of Aug before the hotel rates go up in Sep and Oct with fashion week and stay up though the holidays. I'm quite curious how you get around on the subway, rollpositive. 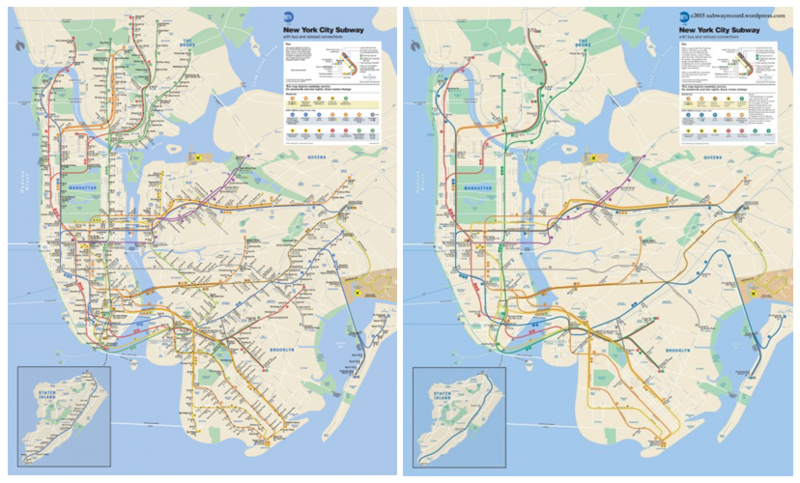 As I posted above, 75% of subways are inaccessible according to the latest information available on wikipedia. And in my experience that means elevated or subterranean and without elevators. In my opinion it's unimaginable that the richest city in the richest country in the world full of multibillion dollar skyscrapers can't be bothered to put in a few elevators and ramps to make their main mode of transportation ADA compliant 28 years after the ADA was passed, and I don't think that fact should be glossed over and ignored. De Blasio and all of his underlings and predecessors should be ashamed of themselves. Most of the comments related to poor subway access and unreliability of wheelchair taxis reinforced by the first few comments on the app link. You have to know which stations are usable. No different in London, transport for London just did a $8m refurb of one tube station and you still need a ramp to get on/off a train. Welcome to 2018 and disability access laws going back decades! I think that if we decide to do it we need to plan each day very carefully, probably not use my power chair and hotel with good access to subway, bus network. Its interesting in that when we talk to people that live in the city that are wheelchair and more power chair users they dont use the subway? Almost a fear? Remember Subway is just part of the solution...If we are in Central Park and want to get down to Broadway or, Wall Street the subway is the perfect fast and cheap way. Look at the subway as getting you to the area you need then Uber or Bus to get you to the exact location. Wow is what changed it and then came Uber. You dont have to hail a cab any more that is old school. You bring it up on your phone android or apple your gps tells the ride share your address you just confirm it and you put where you need to go. Agree to the price (watch for price surge) and you can watch the drivers in the area on your app pick up the ride. It then gives you an eta of your driver. Its a game changer for our community! I think life is what you make it...we come as tourist each summer from arizona so I think if you have it in your mind that its going to be a bad experience then it probably is. We look at it as part of the adventure! The subway and the whole underground is a world of its own! We can by a week long visitor pass for unlimited bus and subway for less then $30. Some of the stops we know by heart...Grand Central, 42nd st, Madison Sq, Columbus Cir, Wall street, Coney Island. Plus more so when we want to get to one of those areas and we take the elavator to the platforms, sometimes we watch the train approach and not all platforms are even with the train so we roll down the platform till we see a spot that is more smoother to the train level and board. When its busy people are pretty good about moving, once your on we think its fun. If we get to a stop and the elevator is broken we get back on and take it to the next stop or come back around get off on the return trip different elevator. In going 10 plus years I have to say elevators being out is pretty minimal for us.